actor-lab is a parallel, object-orientated control language designed to introduce the ideas of control technology and robotics. Actor-lab was designed to make the teaching of control technology possible in classroom settings where, after a general introduction by the teacher, year 5-7 children work by themselves in small groups with only peer support. The language and the interface were designed to represent the notion of input-process-output that is central to basic robotics and control technology. It's operation can be explained using the intuitively accessible metaphor of a cast of actors able to send messages to each other. The programmers role becomes one of playwright, writing scripts for the actors. You can see video clips of actor-lab in action, together with the models being controlled. 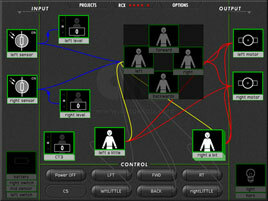 Actor-lab is made freely available for any non-commercial use. The software and documentation are the copyright of the Open University, but may be copied and distributed freely provided that no change is made to them. No fitness for any purpose is claimed for actor-lab and no responsibility is accepted for its use. No guarantee of any support, explanation or guidance as to the use of actor-lab is given. LEGO, RCX, and RoboLab are trademarks/copyright the Lego Company, RoboLab was developed by Tufts University. No connection of any kind with either the Lego Company or Tufts University is implied or claimed for actor-lab or its authors.